I remember the day when this beer made it to my go-to Liquor Mart, some of the younger staff was giggling about this beer. Not only that, I was chatting with friends about this beer and they were giggling about the name.. but for me, I didn't understand why it was so funny. I didn't grow up with a Nintendo so I never played Zelda, so when there's a Legend of Zelda themed beer available in Manitoba.. it just went right over my head! Winnipeg's Kilter Brewing teamed up with Vancouver's Boombox Brewing to create The Legend of Citra, a Double India Pale Ale that tops out at 8.0% ABV. This is only the third beer I've ever had featured Kilter Brewing, the first being their Hawaiian Ivory collab with 2 Crows, and their second being Juicii #3 on tap at Stone Angel Brewing. 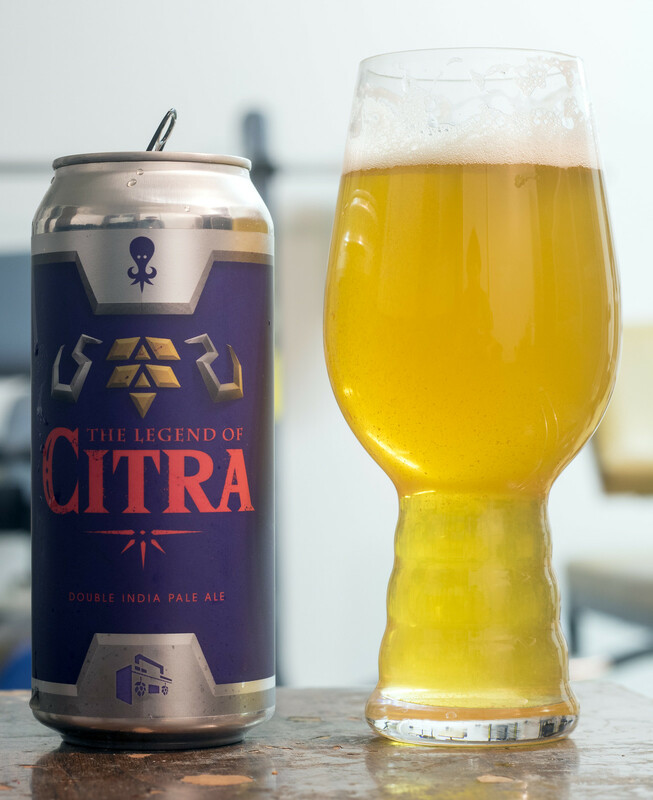 I'm not able to make it out to Winnipeg more than once every 3-4 months so I've been missing out on a lot of beers, but thankfully Legend of Citra was available for me to try here in Brandon! Appearance: Pours a mildly cloudy lemon-yellow body with a moderate amount of sediment floating throughout the body. The head is light off-white with a light amount of lacing on the side of the glass. Aroma: Full on tropical zestiness - there's notes of pineapple, orange, lemon, and lime - full on Five Alive in this drink! There's light floral hop presence, a hint of oats, but even more of the tropical presence popping up at the very end. So far, this definitely has the personality of exactly what I'd expect from both Boombox and Kilter from the very few beers I've tried by either brewery. Taste: It's a sweet, tropical DIPA that has a liberal presence of pineapple, orange peel, lemon and maybe a bit of honeydew? There's quite a decent hop profile popping up in this beer that's giving off a pretty decent pine/floral bitterness to it, a bitterness that even lingers a bit for the aftertaste. Light creamy mouthfeel, a tad cerealy thanks to the oats.. but sweet and tropical for the most part. Overall Thoughts: Solid New England take on a DIPA, though not as sweet/tropical as many of the same style (not a bad thing). It's not a surprise that Kilter's a crowd favourite in Winnipeg - he's (Miguel) made some of the best NEIPA-style beers I've seen outside of New England/Quebec/BC so I'm not surprised he'd do a great job collaborating with Boombox for this beer. I wish I had the ability to go to Winnipeg more often, but unfortunately I'm broke and travelling to Winnipeg costs money!